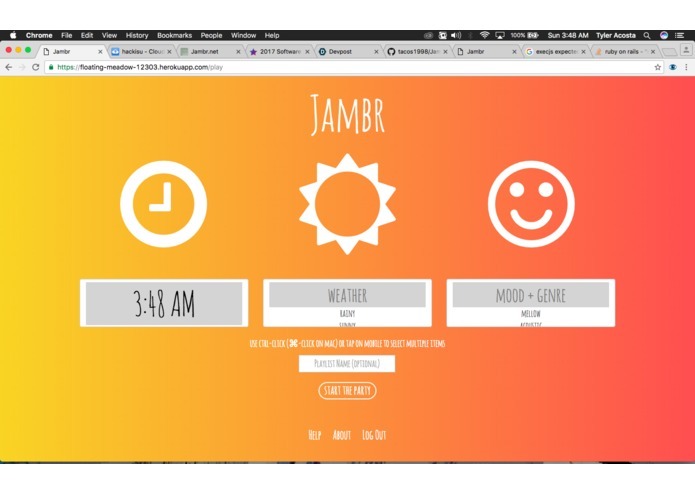 Jambr is a web-based, responsive music app that imports a user's "saved songs" list from Spotify and creates a personal playlist based on tagging and time information. 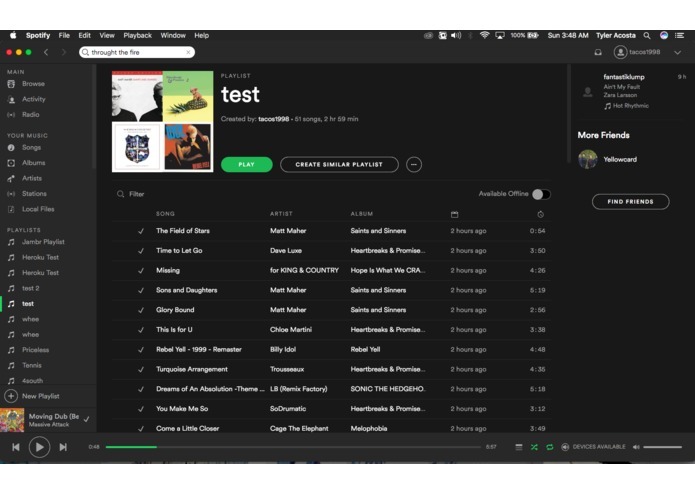 After clicking to sign in with Spotify, the user will see a paginated table that lists all of their saved songs in Spotify. 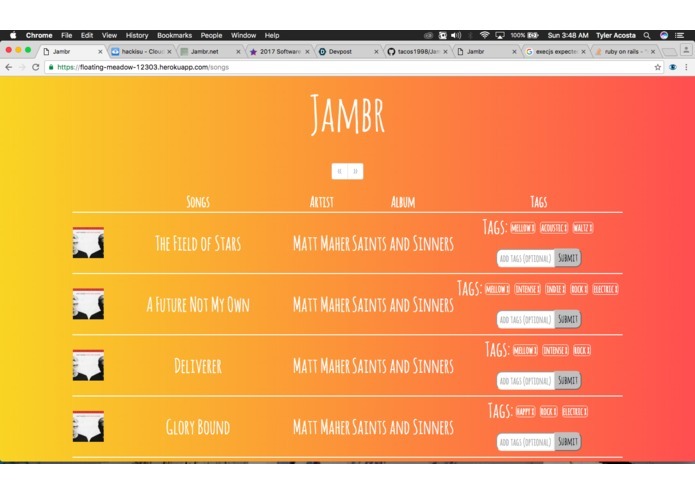 Jambr automatically tags songs based on Spotify metadata (measuring things like valence, tempo, key, acousticness, etc. ), local time data and (potentially) information from other APIs. In addition, users can also input custom tags to improve playlist accuracy. Once tags are added, additional information, such as weather, desired genres, and the user's mood can be selected. After submitting all required information, the resulting playlist will be automatically imported back into Spotify. 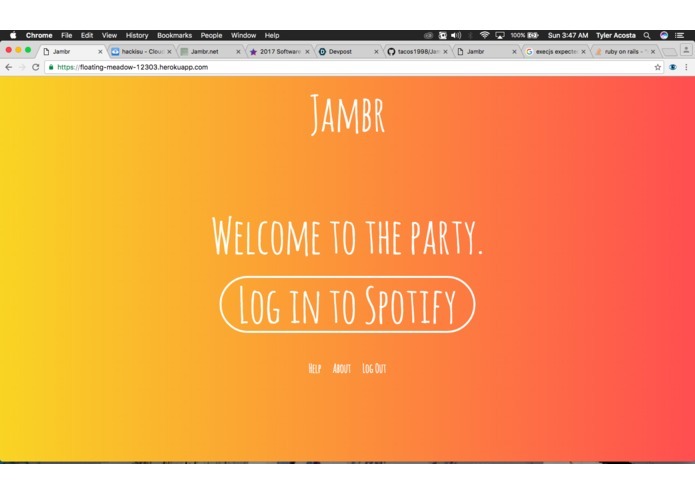 Known Issues (to be fixed in future versions): The resulting playlist will only use the songs that have been loaded in the Jambr web-app. The user must page through all of his/her songs if he/she wishes to include them in the personalized playlist. Refreshing the page results in a blank table. 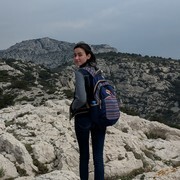 In order to restart the process, the user must logout and login again The tags are not exactly accurate, in this current version of Jambr Not as responsive in Apple OS Input box for tagging does not automatically clear the current input, the user must clear it manually before adding a new tag. Input box for tagging also does not add a tag after hitting enter; the user MUST click "Submit"
In this project, I put most of my efforts into the UI setup and design, using HTML, CSS and Embedded Ruby (through the Rails framework) in conjunction with several other gems/libraries. Over the course of the weekend, my teammates and I learned a lot about how to plan and prioritize in order to complete a rush job. Rails developer studying CS at Truman State. 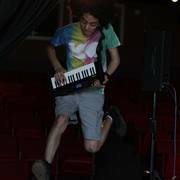 Sings and plays keyboards in geek indie rock group Khan Queso. I mainly worked on the logic behind some of the processes as well as cleaning up some of the UI design. I mainly came to learn and experience what it's like to develop something workable in a short amount of time and I had a lot of fun. Worked on the interfacing with the Spotify API. Prior to this hackathon, I had no experience with the Spotify API.